We’d love your help. 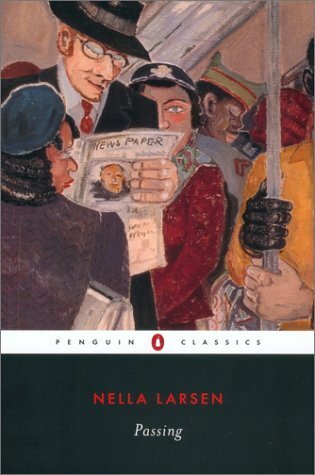 Let us know what’s wrong with this preview of Passing by Nella Larsen. First published to critical acclaim in 1929, Passing firmly established Nella Larsen's prominence among women writers of the Harlem Renaissance. The Modern Library is proud to present Passing — an electrifying story of two women who cross the color line in 1920s New York—together with a new Introduction by the Obie Award- winning Alternate Cover Edition can be found here. First published to critical acclaim in 1929, Passing firmly established Nella Larsen's prominence among women writers of the Harlem Renaissance. The Modern Library is proud to present Passing — an electrifying story of two women who cross the color line in 1920s New York—together with a new Introduction by the Obie Award- winning playwright and novelist Ntozake Shange. Irene Redfield, the novel's protagonist, is a woman with an enviable life. She and her husband, Brian, a prominent physician, share a comfortable Harlem town house with their sons. Her work arranging charity balls that gather Harlem's elite creates a sense of purpose and respectability for Irene. But her hold on this world begins to slip the day she encounters Clare Kendry, a childhood friend with whom she had lost touch. Clare—light-skinned, beautiful, and charming—tells Irene how, after her father's death, she left behind the black neighborhood of her adolescence and began passing for white, hiding her true identity from everyone, including her racist husband. As Clare begins inserting herself into Irene's life, Irene is thrown into a panic, terrified of the consequences of Clare's dangerous behavior. And when Clare witnesses the vibrancy and energy of the community she left behind, her burning desire to come back threatens to shatter her careful deception. To ask other readers questions about Passing, please sign up.